Thursday 4/28: Purgatory Cove and Forest Grove were pretty quiet. 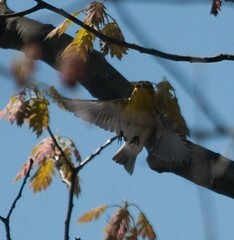 Friday 4/29: Prospect Hill was shockingly quiet but did manage first of year catbird. Saturday 4/30: Saw something at Mt. Auburn. Plus 11 warblers and various other spring birds and an American Lady or two. Sunday 5/1: Arlington Res: 5 Least Sandpiper, Warbler Vireos, no new warblers. Afternoon around the Charles: gnatcatcher on nest, Great Crested Flycatcher, patch tick Red-breasted Nuthatch, and returning Yellow-throated Vireo. Monday 5/2: Dodged science field trips at Paine and then even more people at Beaver Brook for a couple Yellow-rumps and a Clouded Sulphur. Tuesday 5/3: BBN before work: Chestnut-sided, Ovenbird, 2 Parula, 2 Yellowthroat, Wood Thrush, more of the regular stuff. Prospect Hill at lunch: 3 Ovenbird, BT Green, Coyote (‘following’ me up the slope a bit). 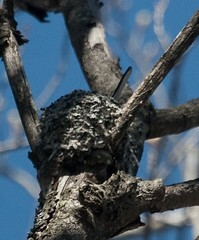 Wednesday 5/4: Took the GPS to the gnatcatcher nest to confirm that it is in Boston South 1. Vireo was cooperative and warblers all over although I didn’t have time to sift through. Great Meadows in the evening to try for the whistling-ducks. Wet and quiet.